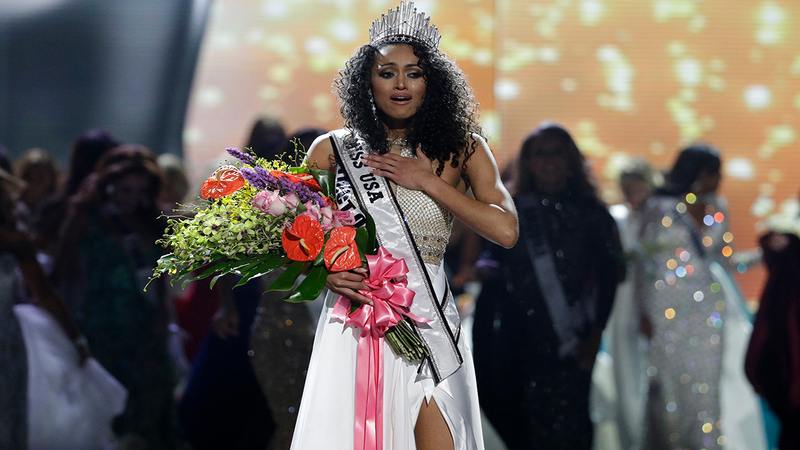 LAS VEGAS, Nevada -- Kara McCullough, a scientist working for the U.S. Nuclear Regulatory Commission, has been crowned Miss USA. "I love science," McCullough said after the Sunday event. "I look at this as a great opportunity to ... get to experience worldwide culture, as well as just having the opportunity to be impacted by so many children, hopefully in the math and sciences." This was the second year in a row that the representative of the nation's capital won the Miss USA title. Last year, District of Columbia resident Deshauna Barber became the first-ever military member to win Miss USA. This year's top five finalists were asked questions that touched on the pros and cons of social media, women's rights and issues affecting teenagers. McCullough was asked whether she thinks that affordable health care for all U.S. citizens is a right or a privilege. She said it is a privilege. The contestants' remarks contrast with the controversy that surrounded the pageant in 2015, when then-part owner and now U.S. President Donald Trump offended Hispanics when he made anti-immigrant remarks in announcing his bid for the White House.